Food. Fuel. Land. Water. And nine billion people by 2050. 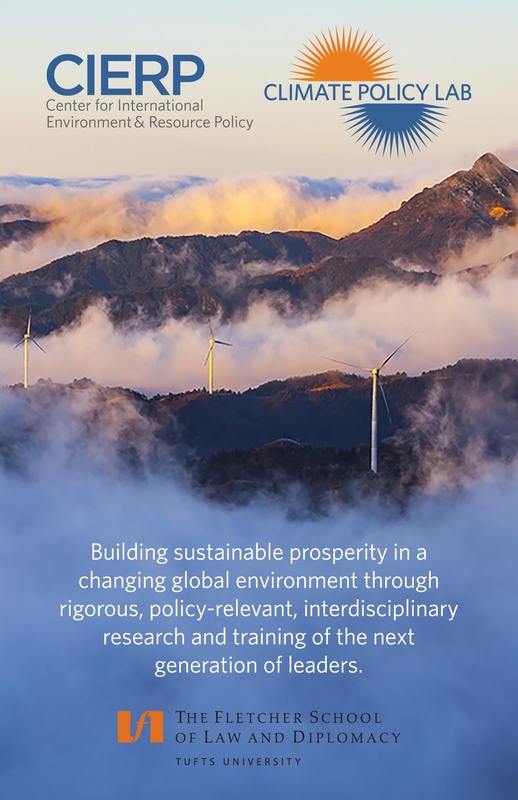 CIERP’s Mission: To build sustainable prosperity in a changing global environment through rigorous, policy-relevant, interdisciplinary research and training of the next generation of leaders. 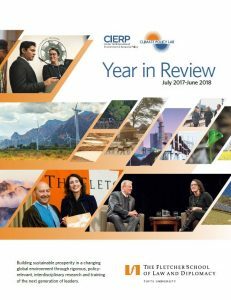 CIERP combines rigorous research, multi-disciplinary graduate education, and executive training to equip current and future policy entrepreneurs with both the knowledge to craft evidence-based policy in a global context and the skills to implement it. 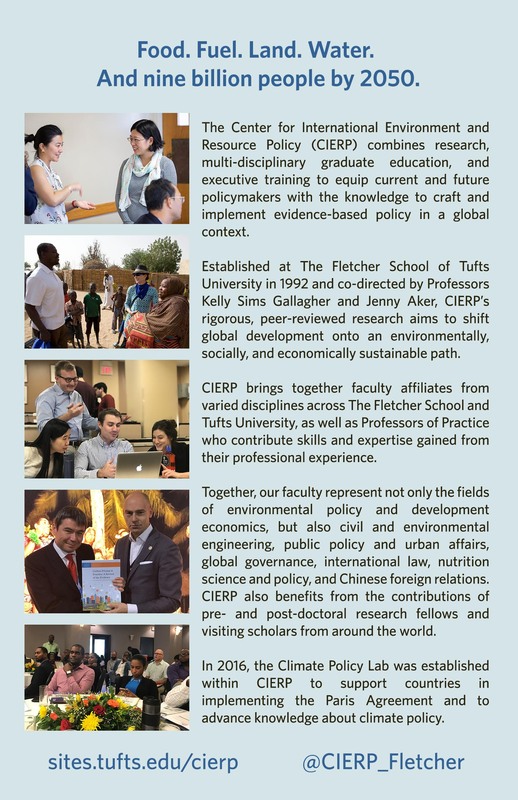 Established at The Fletcher School of Tufts University in 1992 to meet the growing need for international environmental leaders, the Center for International Environment and Resource Policy (CIERP) develops innovative approaches to shift global development onto an environmentally, socially, and economically sustainable path. CIERP has strong competences in the EU, Brazil, China, and India. 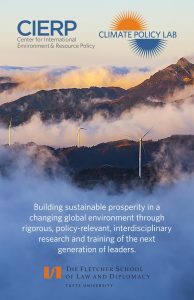 The Center conducts scholarly research on today’s environmental and resource challenges to provide empirical evidence for academics and policy makers. We analyze how economic and social activities impact the environment and design strategies for meeting human needs without straining the planet’s resources. The Center creates new knowledge, with results and insights published in high-ranking academic journals. That knowledge contributes directly to the crafting of policy with faculty and students participating in national and international forums. 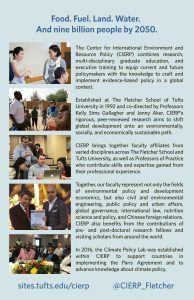 Up to 20% of Fletcher students each year take International Environment and Resource Policy (IERP) courses, which educate and train graduate students for diverse domestic and international careers spanning both public and private sectors. In addition, CIERP offers professional training for government departments, civil society organizations, companies, and academic institutions. This gives leaders and practitioners access to new information and insights, and an opportunity to develop strategies and tools specifically tailored to the challenges they face. Remember to RSVP for this compelling conversation! 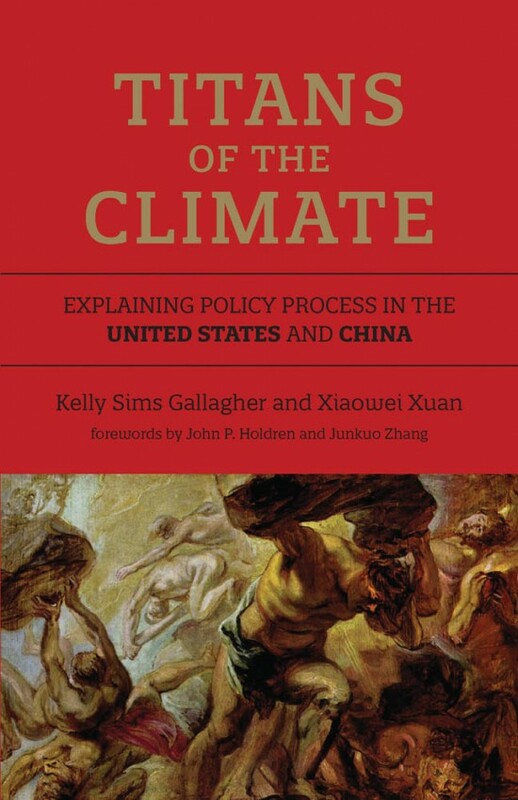 Tuesday, April 23 at 4:00pm in Cabot 702 at the @FletcherSchool - reception to follow!